Four bedrooms, bonus room with queen futon, four and a half bath retreat. Perfect accommodations for family and friends. Site at 3100 elevation, easily accessible on paved roads and driveway with pad for turn-around. As soon as you walk in the front door, you see the amazing view of the peaceful valley, the green tree-covered hills, and the layered blue mountain ridges in the distance. The open floor plan on both levels and the two outdoor living areas provide plenty of space for family and friends to gather. The generous arrangement of bedrooms lets everyone get a good night’s sleep. You’ll enjoy waking up to the inspiring views before you head out to enjoy the day’s activities. · Two-story mountain dream home with long-range views on a scenic wooded lot. 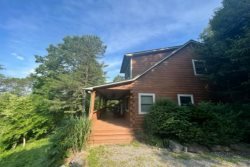 · Elevation at 3200 feet, easily accessible by paved roads; in addition, driveway with parking pad. · 4 bedrooms, including one master down and up, and video game room/office with queen futon, 4 ½ baths, 2 kitchens, 2 living rooms, billiard area, 4 high-definition smart TVs, including 2 each at 50” and 32”. · Perfect accommodations for families and groups of friends. · Exquisite furnishings and décor in a rainbow palette that brings in the colors of the mountains. · All bedrooms have walk-in closets and en suite bathrooms with granite vanities. · Artwork in each room, featuring inspiring mountain ranges from around the world. · Dish Network with well over a hundred channels and high-speed internet with no data limits. · Tile foyer with adjacent half bath. · Open floor plan with a wall of windows on distant mountain vistas. · Living room with multi-color electric linear fireplace, 50” smart TV, dual loveseats, and pair of relaxing swivel chairs facing the mountains. · Dining room with stunning picture window and wooden table to seat 8 (or 12 when extended) framed by bench and matching chairs. · Fully-equipped kitchen with stainless steel appliances and two-toned gray and white cabinetry. · Extended quartz island with four padded bar stools that swivel and adjust to height. · Separate coffee bar with beverage refrigerator, bar sink, and second microwave. · Adjacent laundry /mud room with a storage bench and coat rack. · Open deck connected seamlessly to covered porch with recessed lighting; furnished with four rocking chairs as well as a gas grill. · King bedroom suite on view with custom tiled bathroom, two separate vanities, and walk-in shower. · Direct walk-out to the covered porch. · Front bedroom with queen bed, professional desk, 32” inch smart swivel TV, and direct access to complete bath with tub. · Spacious, open living room with dual-reclining sectional couch, and 50” smart TV mounted over an electric fireplace. · Genuine slate 8’ pool table. · Full kitchen with refrigerator, dishwasher, sink, range, microwave as well as toaster oven and blender. · Moveable island with generous storage and two matching bar stools. · Convenient walk-out to concrete terrace facing the view and to dining for six. · Luxurious, seven-seat hot tub directly below the covered porch. · King bedroom suite on the view with full bath and walk-in shower. · Walk-out to the downstairs terrace from the king bedroom or living room downstairs. · Bunk bedroom, 2 sets, twin over two full bunk beds connected by stairs with built-in storage. · Bookshelf with books and games as well as a playhouse under the main stairs. · Port-a-crib and bedding stored away with a stroller and booster-seat in a large walk-in closet. · Private game and bonus room/office with comfortable queen futon and compact desk with X-box One S console with games (user account required for online play) attached to a wall-mounted, swivel TV. · Flexible space for extra guests or a nursery. · Jack and Jill bath with tub between the bunk room and bonus room. This place was beautiful and has lots of room. The view is magnificent. We enjoyed going to Cherokee. We were here for Lindsey's graduation from WCU. We enjoyed playing games with the family. We loved and enjoyed this place! The cabin exceeded our expectations. We had the honor and pleasure to be the first vacation renters. The interior design was well appointed but the view was incomparable! I do plan to return! We had a great family getaway! The views and the accommodations have both exceeded our expectations. We enjoyed family time on the porch rockers, fire pit and walking the grandson around the property.